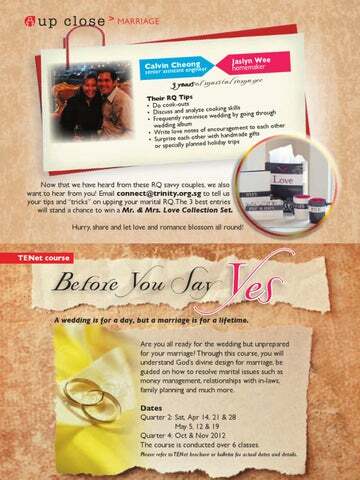 Now that we have heard from these RQ savvy couples, we also want to hear from you! 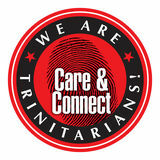 Email connect@trinity.org.sg to tell us your tips and “tricks” on upping your marital RQ. The 3 best entries will stand a chance to win a Mr. & Mrs. Love Collection Set. Hurry, share and let love and romance blossom all round! A wedding is for a day, but a marriage is for a lifetime. Are you all ready for the wedding but unprepared for your marriage? Through this course, you will understand God’s divine design for marriage, be guided on how to resolve marital issues such as money management, relationships with in-laws, family planning and much more. Dates Quarter 2: Sat, Apr 14, 21 & 28 May 5, 12 & 19 Quarter 4: Oct & Nov 2012 The course is conducted over 6 classes. Please refer to TENet brochure or bulletin for actual dates and details.